Explore the work of talent set to make an impact in issue 282 – out now. 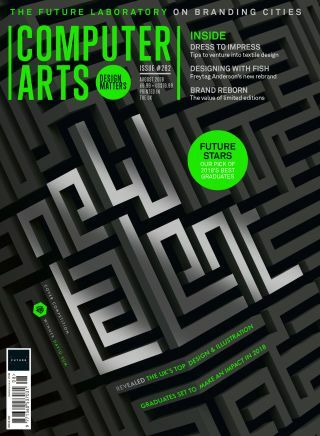 It's that time of the month again: the latest issue of Computer Arts magazine is on sale now. Inside issue 282 we celebrate new talent on the rise in the creative industries as we discover the finest design and illustration graduates across the UK. This includes recent graduate David Sum, who is also the proud winner of our cover competition. Check out his amazing work above. This issue also see the launch of our new Trends feature, a new section that explores the culture, places, events and more that you need to know about. In this month's article our futurists-in-residence, The Future Laboratory, look ahead to the urban environments of tomorrow and ask: is it possible to build a branded city that works for everyone? Elsewhere in issue 282, we look at a virtual reality project that aims to bring back memories to Alzheimer's patients, and delve into the melted plastic work of Nadine Kolodziey. This issue also finds the time to ask: where is the line between design jargon and BS, as well as hearing expert viewpoints on the new identity for the East London charity, City Gateway. Topped off with a look at designer Elizabeth Olwen's Instagram world and an essay on how brand campaigns can stay personable, this promises to be an issue you won't want to miss. Take a look at the lead features inside Computer Arts issue 282 by scrolling left to right through the gallery below with the arrow icons. Computer Arts is the world's best-selling design magazine, bursting at the seams with insights, inspiration, interviews and all the best new design projects. For all this delivered direct to your door each month, subscribe to Computer Arts. Right now you can save up to 60 per cent, and receive a free Computer Arts tote bag when you subscribe.